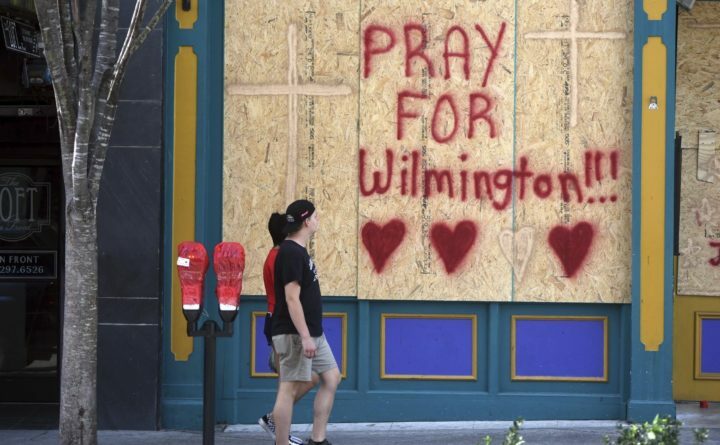 People walk by the boarded up front windows of Bourbon Street on Wednesday in preparation for Hurricane Florence in Wilmington, North Carolina. The effects of Hurricane Florence in Southeastern North Carolina are expected to begin Thursday. The outer bands of Hurricane Florence, a large and dangerous Category 2 storm, landed on the North Carolina coast Thursday morning. Sea water was already surging ashore along the Outer Banks, washing over roads. It marks the beginning of a prolonged assault from wind and water, which — by the time it’s over — is likely to bring devastating damage and flooding to millions of people in the Southeast. Conditions will deteriorate through Thursday: Starting along the coast, winds will accelerate, the rain will intensify, and the angry, agitated ocean will surge ashore. The storm’s center is expected to make landfall Friday in southeast North Carolina, which will coincide with the most severe effects. Storm surge, the rise in seawater above normally dry land at the coast, could rise a story high. On top of that, a disastrous amount of rain — 20 inches, possibly even as many as 40 — is expected to fall. Even though the storm’s category fell from a 4 to a 2 Wednesday, forecasters stressed the category is only an evaluation of the storm’s peak winds in a very narrow core near the center of the storm. The storm’s size and area affected by hazardous winds have actually expanded, and the threat from storm storm and rain-induced flooding “have not changed” tweeted Rick Knabb, The Weather Channel’s tropical weather expert and former Hurricane Center director. The rain threat may not stop in the Carolinas. By early next week, a weakened but soggy Florence may drop rain on already saturated Virginia, West Virginia, Maryland, Washington and Pennsylvania. These areas are vulnerable to flooding and downed trees after heavy rains this summer. As of 10 a.m. Thursday, Florence’s top winds were 110 mph, and it was marching northwest at 10 mph, about 160 miles east-southeast of Wilmington, North Carolina, and 205 miles east-southeast of Myrtle Beach, South Carolina. The storm’s forward motion has slowed 7 mph since Wednesday, which was predicted as the storm nears the coast. The Hurricane Center predicts the storm to maintain this strong Category 2 intensity until landfall, after which wind speeds will steadily decline. Hurricane warnings are in effect for the South Santee River in South Carolina to Duck, North Carolina, and Albemarle and Pamlico sounds. This includes Wilmington. A hurricane watch extends into the Charleston area. A tropical storm warning covers the area from north of Duck to the Virginia Tidewater area. — Edisto Beach to South Santee River: 2 to 4 feet. — Coastal North Carolina: 20 to 30 inches, isolated 40 inches. — South Carolina, western and northern North Carolina: 5 to 10 inches, isolated 20 inches. — Elsewhere in the Appalachians and Mid-Atlantic states: 3 to 6 inches, isolated 12 inches. Much of this rain would fall early next week, rather than over the weekend. Washington Post writers Joel Achenbach and Ann Gerhart contributed to this report.